Registration Volume Scorecard of new Generic Top Level Domains as of August 8, 2014, there are 348 delegated new gTLDs. .XYZ has the highest average daily registration volume with 5,953 registrations per day (an increase of 623 compared to two weeks ago). .BERLIN fell from 1,042 to 993. Both of which offered free domains increasing their numbers which is difficult to compare to other TLDs who only have paying registrants (see below). .REISE which just launched has 917 average names for one day followed by .CLUB at an average of 746 per day (up 743 two weeks ago) along with .WANG at 641 (an increase of 23 per day), and .GURU at 357 per day are paying registrants (a small decrease of 4 over the prior period). Overall, the average daily registrations of new Top Level Domains for the top half of registries is approximately 204 (up from 191). However, if you eliminated .XYZ and .BERLIN from the top half the average per registry falls to 128. 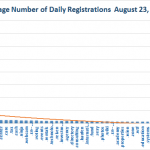 The bottom half daily average number of registrations is 24 (no change when compared to the prior period). 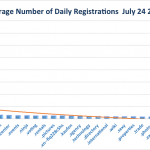 The third and fourth quartiles have no real changes from the prior period with an average of 32 (versus 31) daily registrations and 16 (versus 17) respectively. So in spite of July and August holidays there are some small increases. “The Federal Trade Commission (“FTC”) is investigating the methods by which Network Solutions has marketed its domain name and web hosting services to customers. The Company is cooperating with the FTC investigation. The Company has responded to an FTC Civil Investigative Demand and is responding to additional FTC information requests. The FTC investigation could conclude with a variety of outcomes, including the closing of the inquiry with no action, an order regarding our marketing practices, or a payment to the government or to customers”. Source: SEC.gov.